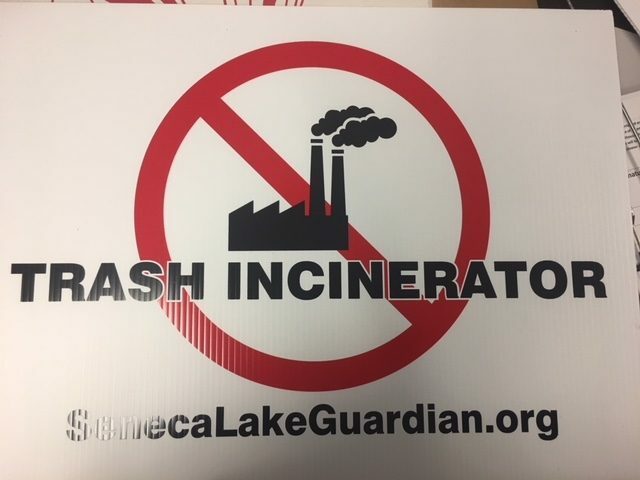 A new company from Rochester wants to build the largest trash incinerator in the state in the small town of Romulus in the Finger Lakes. Many in the area don’t like the idea. About 4,300 people live in the town of Romulus between Seneca and Cayuga Lakes. People packed the Town Planning Board meeting Monday night to hear from Circular enerG, which wants to build the 200,000 square foot incinerator at the former Seneca Army Depot. Some, like Michael Davis, support the project. He’s the president of Finger Lakes Building Trades and the Business Manager for the International Brotherhood of Electrical Workers, Local Union 840. Davis and several of his fellow union members sat up front. “If you can recycle or repurpose this garbage and create a power source from it, especially in the town where they need more jobs, more money and could use the industrial development parcel at the Romulus army depot. It just makes sense,” said Davis. But most attendees were against it. Nancy Walshvelo wore a pin on her sweater with an outline of an incinerator covered by a red circle with a line through it. Late Friday, the company withdrew their application to the town for a permit to build. They’re trying to by-pass town involvement and seek state approval through the Public Service Commission. Nancy Washvelo and her husband say if the incinerator comes, they will leave. The Town Board will meet next week to discuss a temporary moratorium on any energy projects.